Text description provided by the architects. Water is a precious element in residential architecture, almost an essential element of happiness. In Islamic architecture, water is used as a balm to restless minds and is often found in psychiatric hospitals. This justifies our manic search of waterfronts, beachfront, harbourfronts, lakefronts, and riverfronts to settle in. Water is also a divisive element; it creates a barrier or forms a border, such as the moats that surrounded medieval castles, or the swimming pools of today. Australian swimming pools, in particular, create barriers that not just inexperienced swimmers but ones that all residents must face owing to a strict pool fencing code. 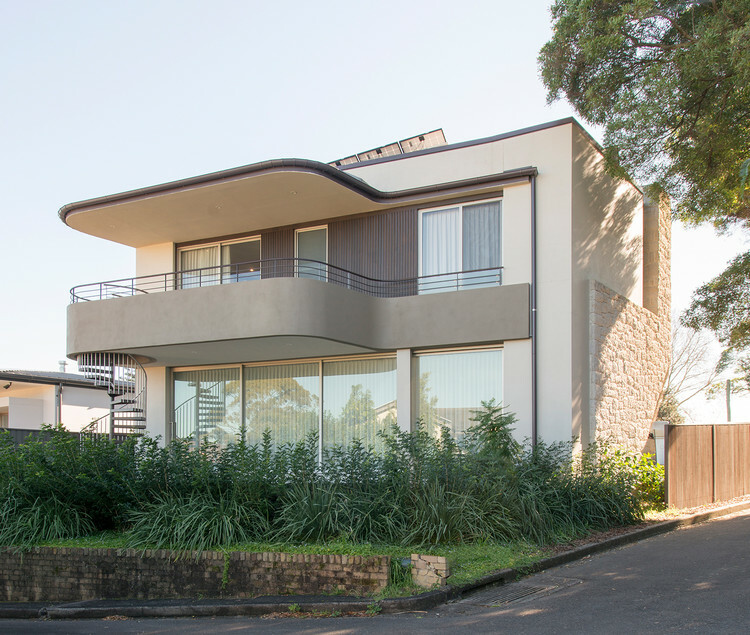 This home in Hunters Hill is accessible only by bridging the swimming pool that surrounds the house on two sides. The structure of the bridge is a pair of slender stainless steel beams covered by a timber slatted walkway; the same slatted timber forms the pool fence on the side; at a required height of 1200mm. The home itself is an ‘L’ shaped two-story residence, with dual aspect, facing the pool on the northern side and a garden to the rear on the other side. A tall sandstone corner contains the external barbeque and the internal fireplace. The general planning and proportions of the house lead to a calm and contemplative design where water is present in every aspect and conveys a sense of tranquillity and balance.